Adrian Gonzalez soothes the savage beasts - Cursed To First - Sox and Pats forever. This helps. It really, really does. As I wrote when V-Mart signed with Detroit, I was not, at that time, prepared to join the knee-jerk pitchfork mob that formed immediately. Rather, I sided with those calling for a bit of restraint while the rest of the off-season plan -- whatever it would be -- had a chance to take shape. But that's not to say I was totally unperturbed at V-Mart's departure. I still wish we had something a little more inspiring behind the plate than a dude we signed out of the minor league system in Texas and a player in the proverbial twilight of his career as a backup. It wasn't so much defense behind the plate I was most worried about -- neither V-Mart or Tek seemed to be able to throw out a baserunner if their lives depended on it, and apparently problems with throwing the ball back to the pitcher are more commonplace than you might think, and it's supposed to be a correctable problem -- as the loss of V-Mart's offensive contributions. There's just no comparing Saltalamacchia with V-Mart when it comes to the stick; given the vast unlikelihood that Jason Varitek will start, the Sox lost close to 150 points in career OPS when it opted for Salty (.701) over V-Mart (.838) as the (apparent) everyday catcher for 2011. Yeah, we can hope for another Adrian Beltre story* for Salty, I suppose, but even in his best year (2007), Salty didn't crack .800. Moreover, in his two years with Boston, V-Mart posted an OPS above his career average, with a cool .912 in 2009 and .844 during an injury-plagued 2010 campaign. This had us all a bit, shall we say, tense. But like I said. Gonzalez is an amazingly effective antidote for that angst, and a vindication for this off-season's anti-knee-jerk movement. In the offensive department, Gonzalez more than makes up for the production decline at catcher, and his acquisition has me much less likely to be tempted to reach for the pitchfork.Interestingly, Baseball Reference puts his wins above replacement at +8, precisely the same as V-Mart. And he brings Gold Glove defense to the first base position, as Youk presumably takes his own Gold Glove talents to South Beach third base. It's clear, amid reports the Sox are preparing a 7-year, $150 million contract extension for Gonzalez, after already packaging two top prospects in the trade with San Diego to get him in the first place, that they expect him to be a franchise player. It's said Gonzalez has the "perfect swing for Fenway", implying his .850 or higher OPS for the last four years in a row will only be improved upon while playing in the lyrical little bandbox. There is just one, tiny, nagging little doubt in my mind as I consider this early Christmas gift from Theo, though, and that's the potential for Edgar Renteria Syndrome. Gonzalez has put up his lifetime numbers in the NL West, and has spent the bulk of his career in the epitome of the sleepy small-market atmosphere. I've been to one Pads game, which obviously doesn't make me an authority, but it was against the division rival Giants on a beautiful, mild, late-April evening in San Diego...and I'm pretty sure I've heard more noise at Fenway as the stands clear after a game than I heard that day at Petco. It helps that his buddy Dave Roberts apparently talked Boston up to him before the deal was done, and obviously, any friend of Dave Roberts is a friend of ours, at least until proven otherwise. I doubt the Sox would commit this fully to a player if there were doubts about his makeup in that way, but then again, they're also the ones who signed Edgar Renteria. And I think to a certain extent, while you can sense which players are probably suited to the Boston atmosphere before they get here, you can really never be certain until they're actually out on the field. But that's just the Debbie Downer in me talking. We can't count our chickens and other assorted cliches, but I'm not going to act like an infield of Gonzalez, Pedey, Scooter and Youk -- not to mention a potential lineup including Ellsbury, Pedey, Papi, Gonzalez, and Youk (and yes, that would be my top 5 in order)--doesn't put a renewed spring in my step. Next order of business...the bullpen. And who exactly is gonna play center field (I'm rooting for Ryan Kalish to retain a spot in the outfield next year, either in left or center, but it would be nice just to have that settled one way or another). I'm doing my best not to get caught up too much in the dead-end rumors and hollow hype that always accompany the Hot Stove, but more on the bullpen situation (including the rumored Brian Fuentes deal) as events unfold. * Speaking of which, Beltre is apparently the odd man out in the wake of the Gonzalez deal. Which might be best for the team, but I am going to miss him and V-Mart and their head-rubbing hijinks. I don't think a comparison of Gonzalez and Renteria applies. Renteria was never THE guy on a team before. He was always just one guy in a crowd, maybe the 4th or 5th best hitter on a small market or midmarket team. He was never really in the spotlight. 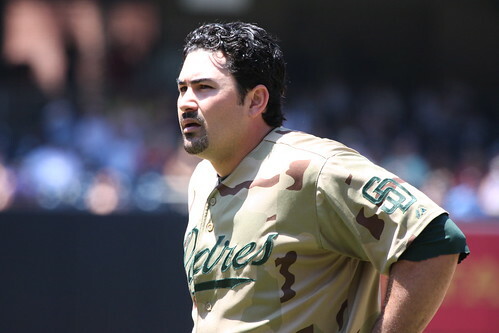 Gonzalez has been THE guy in San Diego for four or five years. He has been the face of the franchise, the best hitter, the best player San Diego has had for years. I think Gonzalez is used to being in the spotlight, even if that spotlight doesn't run as hot in San Diego as it does in Boston. Besides, he's not going to be carrying this offense like he had to do with the Padres. He'll be hitting between Youkilis and Ortiz, with Ellsbury and Pedroia setting the table. I think he'll thrive in a lineup like that. Also, it's worth mentioning just how huge an advantage it is for him to move from San Diego to Fenway. Over the last three years Gonzalez has hit .257 at home with 37 total home runs. In that same period on the road he's hit .310 with 70 home runs. Clearly hitting in a pitchers park has held his numbers back. What do you think his overall numbers would look like if he'd been hitting in fenway the last few years? With road numbers like that, he's pretty fearsome. If he played all his games on the road these last three years, those stats would project out to 46 HRs per season. I think that's what his potential is with 81 games in Fenway next season.